This DTC is stored when the engine coolant temperature does not reach 75°C (167°F) despite sufficient engine warm-up time having elapsed. (b) The engine is warmed up. 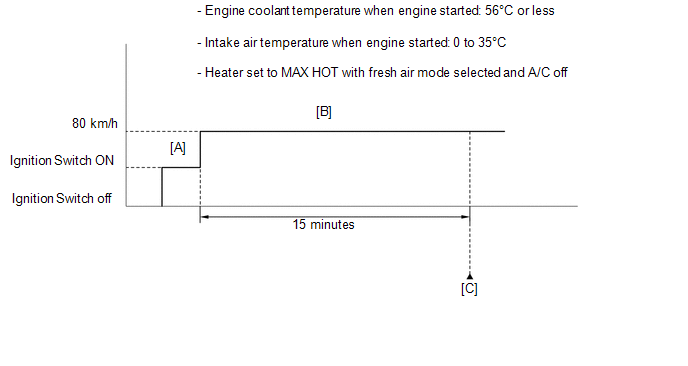 (c) The engine coolant temperature is below 75°C (167°F). The ECM estimates the engine coolant temperature based on the starting temperature, engine loads, and engine speeds. The ECM then compares the estimated temperature with the actual engine coolant temperature. When the estimated engine coolant temperature reaches 75°C (167°F), the ECM checks the actual engine coolant temperature. 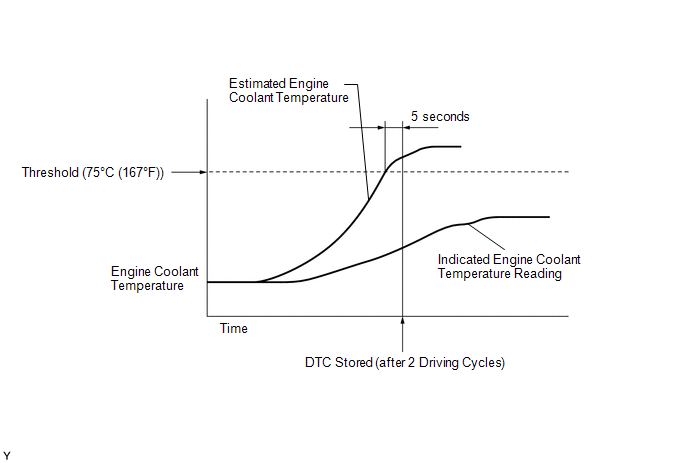 If the actual engine coolant temperature is less than 75°C (167°F), the ECM interprets this as a malfunction in the thermostat or the engine cooling system and stores the DTC. Stop the engine and allow it to soak. Enter the following menus: Powertrain / Engine / Data List / Primary / Coolant Temp and Intake Air. Check that "Coolant Temp" is 56°C (133°F) or less and "Intake Air" is between 0 and 35°C (32 and 95°F). Set the heater to MAX HOT with fresh air mode selected and turn the A/C off. Start the engine and drive the vehicle at 80 km/h (50 mph) for 15 minutes [B]. Data can be captured relatively easily by using the snapshot function in the Data List. Enter the following menus: Data List / Function / Snapshot Configure / Duration / 5 min. Data capture can be started by using the target point function. For example, setting the target point to an engine speed of 4000 rpm and then racing the engine, etc. to raise the engine speed to a speed of 4000 rpm or higher will cause data capture to start. After "Coolant Temp" stabilizes, check that "Coolant Temp" is 75°C (167°F) or higher [C]. If "Coolant Temp" is less than 75°C (167°F) while driving the vehicle at 80 km/h (50 mph), inspect the cooling system and thermostat. (a) Check for defects in the cooling system that might cause the system to be too cold, such as abnormal cooling fan operation or any modifications.